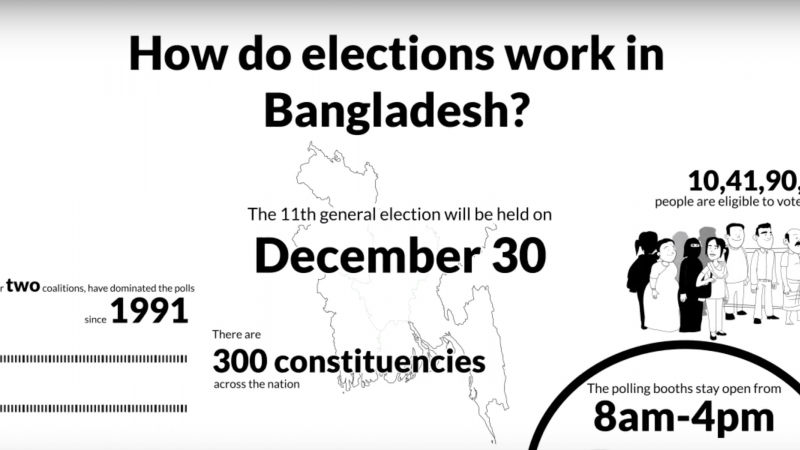 How do elections work in Bangladesh? Screenshot from YouTube Video by Dhaka Tribune. Elections in Bangladesh are usually fanfares with crowds, noise, and tension. Millions of voters journey home to their own constituencies and candidates travel door-to-door asking for votes using innovative strategies like motorcycle rallies and assemblies. On December 30, 2018, Bangladesh will hold its 11th parliamentary election to determine the 299 elected members of Jatiya Sangsad (national parliament) who will lead the country for the next five years. Tensions mounted in the country on the night of December 27 when the Bangladesh Telecommunication Regulatory Commission (BTRC) ordered through an e-mail four mobile operators to suspend 3G and 4G services in a move to slow down the internet (to prevent video uploads and fast sharing). The next morning, services were restored without explanation. 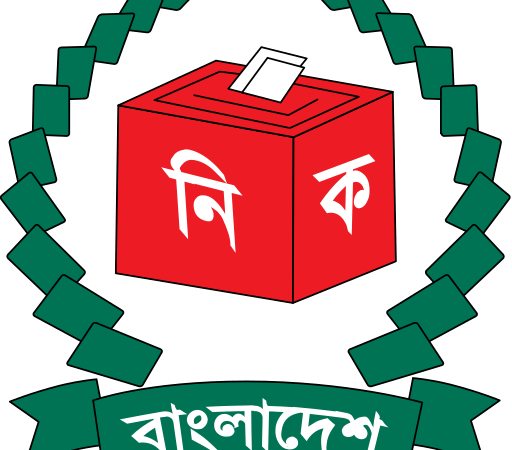 Bangladesh Election Commission logo, used with permission via Wikipedia Commons. The election campaigns this year looked a bit different. The Grand Alliance, the coalition government led by Prime Minister Sheikh Hasina‘s Awami League, has been more prominent as the Jatiyo Oikya Front (National Unity Front), led by a five-party alliance, accused the government of creating a “climate of fear” by using tactics like the mass arrest of opposition activists. The rivalry between the country’s two main political alliances and their leaders is a source of political instability and the country was subjected to military rule a few times as a consequence. The Jatiyo Oikya Front alliance includes the opposition Bangladesh Nationalist Party (BNP), who named lawyer and politician Kamal Hossain because their leader, BNP chairperson Khaleda Zia, is in jail after being convicted in a graft case earlier this year. The acting chairperson, her son Tarique Rahman, is a fugitive from the law in an assassination case and is exiled in the UK. Jatiya Sangsad consists of 300 directly elected seats with single-member constituencies, and an additional 50 seats reserved for women based on the proportional vote share of the contesting parties. There are 300 seats to grab for the December 30 election, except one deferred following the death of a candidate. A total of 39 parties have posted 1749 candidates. Bangladesh has a population of approximately 164 million with 104 million registered voters (above the age of 18). Grand Alliance: This alliance has been ruling since winning the 9th parliamentary election on December 29, 2008. Other political parties currently included in the alliance are the Jatiya Party, the Jatiya Samajtantrik Dal – JaSaD, the Bangladesh Tarikat Federation, the Workers Party, Bikalpadhara Bangladesh and the Jatiya Party (JP). A major player in this coalition is Jatiya Party (Ershad), which has secured 26 candidacies through the Grand Alliance. However, they have fielded 150 candidates outside the Grand Alliance, which may influence the results. In the 10th parliamentary election on January 5, 2014, the Awami League took advantage of a walkover with the BNP and other opposition parties, who refused to participate, citing widespread arrests of opposition members and pressing for their demand to hand over power to a ‘caretaker’ government — which the government claimed was unconstitutional. 20-Party Alliance: This alliance, led by the Bangladesh Nationalist Party, is the traditional foe of Awami League’s Grand Alliance. It ruled the country winning the elections in 1978, 1991, 1996 and 2001. The pact currently consists of the Liberal Democratic Party, the Khelafat Majlish, the Bangladesh Kalyan Party, the Jamiat-e-Ulama-e Islam, the Jatiya Party (Kazi Zafar), the National People’s Party and the Labour Party among others. The BNP has a dark record of harboring religious extremism as it partnered with the right-wing Islamist party Bangladesh Jamaat-e-Islami, whose leaders have been barred from contesting in prior parliamentary elections because its registration was declared illegal in 2013. Its charter violated the constitution. Jatiya Oikya Front (National Unity Front): This is a new alliance of five parties: the 20-Party Alliance has joined forces with the Gono Forum, the Krishak Sramik Janata League, the Jatiya Samajtantrik Dal – JSD and the Nagorik Oikya to create a new alliance in October 2018 and has chosen Dr. Kamal Hossain as its leader. The alliance has already shown some rifts over a number of issues. Left Democratic Alliance: This coalition includes a number of left-wing parties, namely the Communist Party of Bangladesh, the Bangladesh Samajtantrik Dal and the Revolutionary Workers Party of Bangladesh. A recent Human Rights Watch report finds that the government has used authoritarian measures on opposition political activists, including widespread surveillance, that has contributed to a climate of fear ahead of the elections. As of December 17, at least 26 opposition candidates’ motorcades had been attacked, 13 opposition candidates had been injured, two had been arrested, and 875 opposition supporters had been injured, some critically. In the same period, two Awami League members had been killed and 75 injured. According to the BNP, more than 300,000 leaders and activists have been accused in ‘false and fabricated’ cases over the past decade, and thousands have been arrested ahead of the polls. Thousands of Bangladeshis have faced detention and legal harassment in recent months for comments deemed critical of the government. Others, directly linked to opposition parties, say they live in constant fear of arrest, or even enforced disappearance or extrajudicial execution. In a recent Netizen Report, Global Voices highlighted that political activity and news are targeted online. The official website of the BNP was blocked for a period of time as the Bangladesh Telecommunication Regulatory Commission claimed the website presented “distasteful” content that could harm law and order. Bangladesh authorities have tried to stifle dissent and criticism including on newspapers, television networks, and on social media. Journalists said that the Digital Security Act (DSA) effectively prohibits investigative journalism. With more than 42,000 polling centers across the country, only 25,920 local observers have been cleared to monitor the polls. The number of local observers has been reduced significantly as the nongovernmental organization Affairs Bureau has not granted the “No Objection Certificate” to use foreign funds to carry out work of the 15 Election Working Group members. An approximate 175 foreign observers are set to participate, but the Government of Bangladesh could not grant credentials and issue visas within the timeframe necessary so many will not make it. The election campaigns ended Friday, December 28, and the country will brace for elections on Sunday. Kazi Anis Ahmed, the publisher of the Dhaka Tribune, opines that Bangladeshi voters have a hard choice to make between authoritarianism or extremism.